Monthly disposable coloured contact lenses for that natural eye colour change. 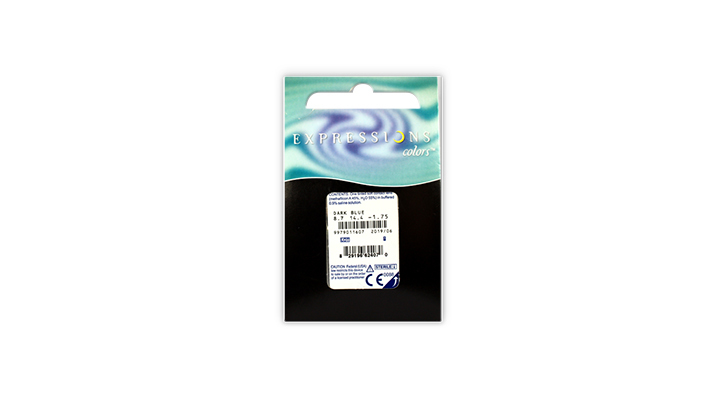 Expressions® Colors are an exciting monthly disposable coloured contact lenses from CooperVision. With Expression® Colors now even dark brown eyes can be blue or green. HELP! I think I am becoming a contact lenses wearaholic!!!!!! Can`t stop buying them...Grey, Green and now Blue...and I am on the website because I am about to buy the forth pair!!!!! These contacts are lovely, amazing colour, easy to put in, comfy to wear. A+! Love them! I`ve ordered a variety of the colors in the past and people are always shocked to find out that they are contacts. I`ve tried most of the color contacts available and I can say that these are by far the best, Confortable and the color looks real and pure. I bought these as I wanted to try a different brand to freshlooks which just don't sit well in my eyes. These fit perfectly and feel pretty comfortable. I have tried the aqua and the grey and both look amazing. Natural but not at the same time. It's great and I have just ordered another pair of aqua as I have been using the grey for a while. Definitely try as they seem to be a better shape and if other brands are not as comfortable for you. My fault for not checking the "colours" before buying - did not realise ALL the lenses have yellow coloured centres. A few mm larger than others I have used & I can feel this difference as a slight discomfort. I bought the Aqua as they were the only ones in stock for immediate delivery and a wait of a week for the others, but really glad I got these, they arrived the next day, and wearing them: the difference is subtle and beautiful and no-one can put their finger on what is different about me, but I've had loads of compliments about how nice I look lol. They take about 10 minutes to get used too once they are in. Thankyou, great price, by far the cheapest brand named on line and free postage too.